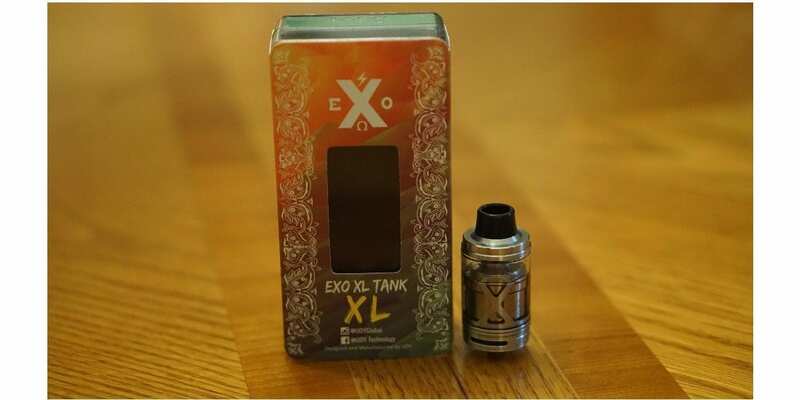 IJoy Exo XL Tank Review - Daily Vaping Deals & The Best Vape Product Reviews at Vaping Cheap! IJoy is known for their excellent atomizers, especially when you consider the price points of them. IJoy has released quite a few tanks that have gained much popularity, even back to the original IJoy Tornado and Tornado Nano. 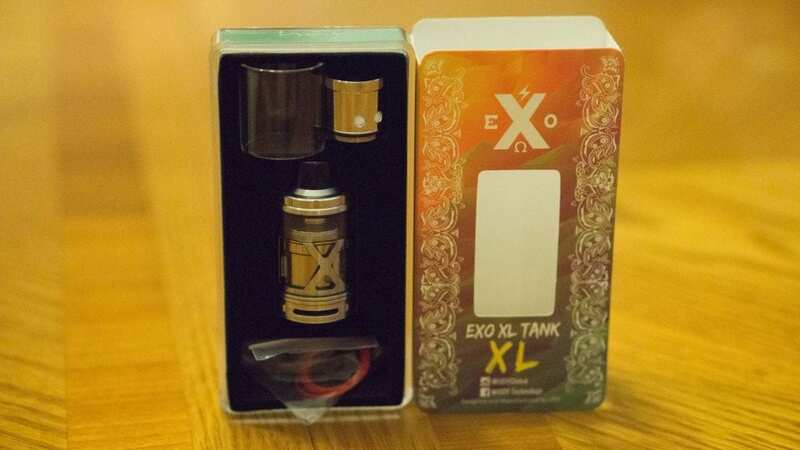 Now, IJoy has released their newest tank series, the Exo, and in this review we will be covering the IJoy Exo XL Tank. Before getting any further, I would like to thank Heaven Gifts for sending this product my way for the purposes of this review. I will go over my first impressions out of the box, its performance, pros and cons, and conclude with whether or not I would recommend this atomizer! Check out the IJoy Exo XL Tank Here! Click Here to Check out the IJoy Exo XL Tank! Upon receiving the IJoy Exo XL Tank, the first thing I noticed was the familiar IJoy packaging. Many of IJoy atomizers, especially sub ohm tanks and RTAs come in this same type of packaging, which is certainly a good thing since everything is seated well and protected, so there are no worries when this tank is in transit. I do like the colorful packaging, since it does differentiate itself from all of the other packaging from previous IJoy atomizers, and it just looks good in my opinion. Something small to look at, but I do appreciate good presentation of a product. Included in the packaging you do receive the IJoy Exo XL Tank with a pre-installed XL-C2 coil head, an additional XL-C4 Coil, a spare glass tank section, a 510 drip tip adapter, and a bag of spares. Honestly, I was surprised at the fact that this tank did not come with an RTA section, since there is an RTA deck available for this sub ohm tank. In addition, many IJoy tanks do include the RTA section, so this is definitely considered a con. What I noticed first about the tank is the overall size. This tank is quite large, but I do like the design of it. 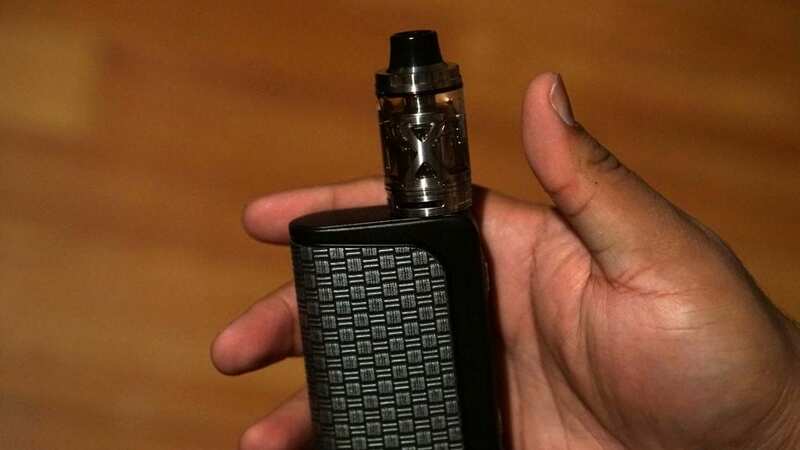 I can see some vapers not liking its larger size, but that is subjective of course. The IJoy Exo XL has an overall diameter of 26mm to be exact, so it’ll look good primarily on larger box mods. I found it interesting that they went with 26mm in diameter rather than 25mm, since most larger tanks are either 25mm or 30mm. This tank does have some similarities to the IJoy Limitless XL, but differs in key areas, such as the airflow. One major issue with the IJoy Limitless XL was the condensation due to the airflow design. With the IJoy Exo XL Tank you won’t have that issue whatsoever since the airflow is not underneath the tank. Also, it’s very easy to adjust the airflow control on this sub ohm tank. Also, the drip tip is designed differently as well, and I do prefer this style of drip tip in comparison to the IJoy Limitless XL. Also, this drip tip is constructed of delrin, which is something I highly prefer, so this is a pro for sure. It is quite comfortable when first trying it out, but I was glad that they included a 510 drip tip adapter, just in case you might want to use your own preferred drip tip. This is once again another pro in my book. The overall construction of this tank was solid. All of the threads were clean and had no burrs. I do want to mention though when first trying to take apart this tank, everything was tight and it took quite a bit of strength to actually take it apart. This is a con, but not a major con by any means, just something worth mentioning. The fill ports for the top fill section are quite large as well. Honestly, it doesn’t matter what type of e-liquid bottle you have, you will have no issues filling this tank. In addition, the IJoy Exo XL does have a large 5ml e-liquid capacity, which is surely a pro. The included coil heads are quite different from one another, the pre-installed XL-C2 coil looks to be similar to the coil head found in the IJoy Tornado Nano. The resistance of this coil head is 0.3 ohm, and is rated up to 80w. In addition, the XL-C2 coil head features a horizontal coil design. The XL-C4 coil features a vertical coil design and has a resistance of 0.15 ohm. Also, this coil head is rated up to a whopping 215w! It was nice to see that IJoy included two different coil heads that offer two unique vaping experiences. I do want to mention that this tank came clean with no machine oil! One wash with warm water, and this tank was good to go! Overall, my first impressions of the IJoy Exo XL Tank were positive! In the next section, we will cover the performance! Like mentioned previously, the IJoy Exo XL Tank does include two different coil heads, the XL-C2 and the XL-C4. The first coil head I tested was the XL-C4, which is the 0.15 ohm coil that is rated up to 215w. This specific coil head did have a break in period of about half a tank, which is not terrible by any means since most coil heads have some sort of break in period before giving you full on flavor. I first started vaping this coil head at about 50w which is the lowest wattage recommended for this coil head. At 50w, I didn’t really get any vapor production, and I could immediately tell that this coil head needs a lot more power to deliver. At about 70w is when this coil head would start to perform, but the vape was a bit cooler than I would prefer. The flavor was okay at this wattage, and the vapor production was decent. When I started vaping the XL-C4 at 90w is when it started to perform well. I got a warmer vape, and the flavor was much better. I turned up the wattage again to about 110w, and the vape was much warmer, and the flavor was even better in my opinion. I found that between 90w and 120w was the sweet spot for this coil head. When vaping this coil at higher wattages such as 150w and above, the vape was a bit too hot for my liking and the flavor started to diminish a bit. It is worth mentioning that this coil head does keep up quite well even when chain vaping at higher wattages. When vaping at these higher wattages I did leave the airflow wide open. With the airflow wide open, it is quite airy, but it does have a slight restriction to it, which I do enjoy. When closing it off about a bit, it does increase the flavor a bit, but honestly I actually preferred the airflow wide open. For vaping at higher wattages, the airflow is near perfect in my opinion when it’s fully open. Also, the airflow is nice and smooth regardless if closed or wide open, which is certainly a pro! The included wide bore delrin drip tip never got hot even when vaping at these higher wattages, so this is definitely another pro. Also, I never had a desire to use my own 510 drip tip, since the included drip tip was quite comfortable. The vapor production of the XL-C4 coil head is top notch. It produces a ton of vapor that would satisfy most vapers in my opinion. I do want to mention that vaping at these higher wattages you will go through e-liquid quite quickly. A full 5ml tank would last me about an hour or so while chain vaping between 90w and 110w. Thankfully, filling this tank is incredibly easy. If I wasn’t vaping so often, I could get a full tank to last me a couple of hours before needing to refill. I do want to mention that I did experience some spitback while vaping this coil head. The spitback didn’t happen every time I took a vape, but it happened enough where I felt that it was worth mentioning. This is definitely a con in my opinion, because if you’re vaping at very high wattages, you’ll get extremely hot e-liquid into your mouth if it does spitback. The other coil head, which is the one that is pre-installed is the XL-C2. This coil head has a resistance of 0.3 ohm, and is rated between 40w and 80w. Like mentioned previously, this coil head features a horizontal coil design. In my opinion, this is a con as vertical coil heads are simply better in my opinion. They typically product better flavor, and just perform better. With that being said, I honestly did not expect this coil head to perform as well as the XL-C4. This coil head had about the same break in period as the previous coil. I started vaping this coil head at the recommended lowest 40w. At this wattage, the performance is decent, but I figured it would get better at higher wattages, and it did. Between 50w and 65w, is where I find this coil to perform best. The vape was warmer, and the flavor was good, but not as great as the XL-C4 in my opinion. The vapor production was also good with this coil head as well. Of course, it wasn’t as great as XL-C4 coil head since it cannot handle the same wattages, but still pretty good in my opinion. Honestly, my favorite coil head for the IJoy Exo XL Tank was the XL-C4 by far. This coil head just simply outperformed the XL-C2. However, if you do like vaping at lower wattages then the XL-C2 might be great for you since it would better suit your vaping style. 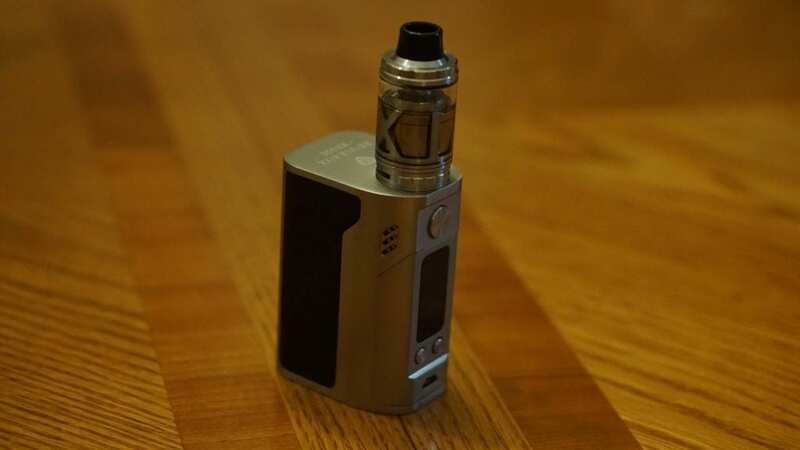 Overall, the performance of the IJoy XL Tank was solid, especially with the XL-C4 coil head. The airflow was nice and smooth, and the flavor was great. In conclusion, IJoy has delivered yet another great atomizer. The IJoy Exo XL Tank is a solid performing sub ohm tank that offers great flavor, and smooth airflow. There are cons that were mentioned, but none that I feel that would be deal breakers. It would have been nice if IJoy did include the RTA deck section, but at least there is one available, so if you don’t want to buy additional coil heads and want to build your own coils then you can just purchase the RTA deck. The XL-C4 coil by far outperformed the XL-C2 coil, so if you are interested in this tank I would highly recommend trying that coil out first, especially if you like vaping at higher wattages. Even at these higher wattages, the vape experience was still smooth. If you’re a fan of IJoy sub ohm tanks, you certainly won’t be disappointed with the IJoy Exo XL. IJoy has been delivering excellent products, and I’m excited to see what they bring to the table later on this year. All in all, if you’re looking for a new high wattage sub ohm tank, and want a larger tank, I can easily recommend the IJoy Exo XL Tank. Great review Steve. I have the older model in which I enjoy. I have this one on the way. The RBA deck from the XL does fit in this tank with no problem. Thanks for letting me know! I don’t have the previous IJoy Limitless on hand to test them, so thanks again! I really enjoyed your review. I’m currently shopping for a new tank and I’m looking at this one to resist heat. My last two tanks have had issues because I vape in quick, heavy sessions. I do vape at lower wattage. Do you think this tank sounds like one that would have less seal warping, or frequent coil changes for someone like me?